TOPEKA, Kan. (May 21, 2017) – Tommy Johnson Jr. wanted to leave Heartland Park with a bang, but Sunday’s explosive first round wasn’t exactly what he and Terry Chandler’s Funny Car team had in mind. During the opening round of competition at Sunday’s 29th annual NHRA Heartland Nationals, Johnson lined up against Del Worsham. Johnson left the starting line first but as he drove down the track, his car blew up in a ball of flames and Worsham drove around him to get the round win. The Make-A-Wish team, led by crew chief John Collins and assistant Rip Reynolds, entered the event as the No. 5 qualifier with a time of 3.847 seconds at Johnson’s career-best speed of 331.61 mph. Unfortunately, Sunday marks the fourth straight race that the Make-A-Wish lost in the first round. 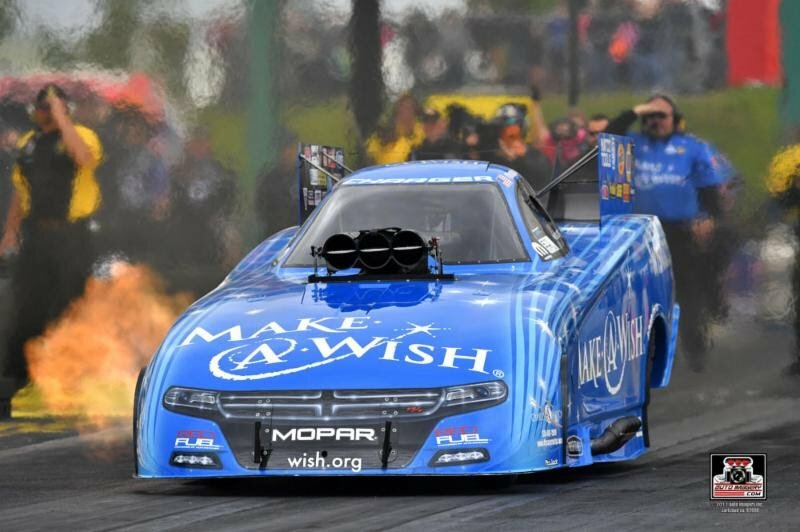 The Make-A-Wish team and the rest of the NHRA Mello Yello Drag Racing series will have the Memorial Day weekend off before heading to Epping, N.H., and the New England Dragway to start the “Eastern Swing” that includes four races in four weeks.